On Sunday, November 26th newcomers to the church were invited to share lunch together to meet, greet, and eat! They learned a little more about Kamloops United Church and had an opportunity to connect with other newcomers. Several leaders in the church shared their enthusiasm about our ministries. 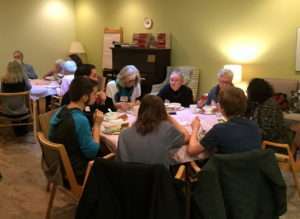 KUC’s “Discovery Circle” hosted the luncheon and the Soup & Sandwich group provided the delicious food. Hospitality with spirit, enjoyed by all. Marnie on KUC, the website and Sunday projection. “What do you like about KUC? Breaking bread together and getting acquainted. “What is the prayer box?